In a fortnight's time, our capital city will be fifty years old. That's Greater London, an amalgamation of former boroughs and districts to become the capital we know today, brought to life on 1st April 1965. You'd think some major anniversary events would be planned, a glorious celebration of our city's diversity and heritage, but no. The GLA doesn't do that sort of thing any more because it takes a) foresight b) planning c) money. Instead it's left to the likes of a few of the individual boroughs to put on their own minor show. Hackney Museum are celebrating their borough's fiftieth birthday with an exhibition entitled Hackney@50, The People's Choice. 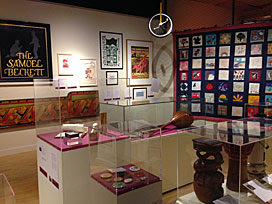 Curators invited fifty local individuals, organisations, groups and schools to select an object to share what Hackney means to them, either from the museum's collection or loaned from elsewhere. This didn't have to be from the last fifty years, hence a lot of people have gone much further back, for example to a Victorian teenager's diary or even a fossil dug up in Stoke Newington. More recent acquisitions include a bus conductor's ticket machine, a dug-up brass time capsule, a closed pub sign, a Thai wooden elephant and a unicycle, which is the sort of thing that happens when you give residents free rein. This being Hackney there's a political slant to several exhibits, be that a set of agitatory badges, a peace quilt, a Tom Robinson Band gig poster or a Sack Boris Oyster wallet. Jane Smith's Hackney Changes map is rather nice, I thought (I think she's still selling it for a fiver). And OK, so maybe the bag of Woolworths Flying Saucers is taking the piss a bit, but in the absence of any other anniversary celebration, Hackney's'll do for starters. Ten minutes tops.